Murray Raphel has traveled the world, speaking to audiences large and small about how to sell their products. 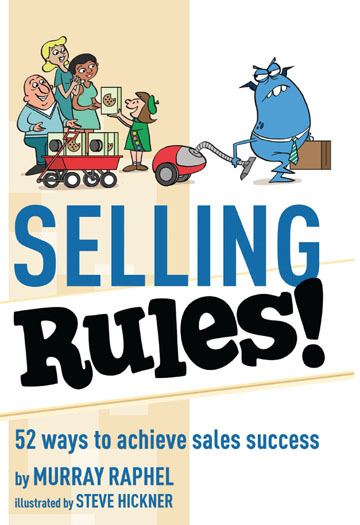 In Selling Rules!, Raphel condenses his half-century of experience into 52 rules that help everyone improve their sales techniques. He reminds us that “everyone sells,” no matter what your profession. Read one rule a week—or all 52 at once! Selling Rules! is your guide to sales success. "The rules are simple, solid, and a surefire guide for the sales professional...and don't be surprised if it tickles your funny bone. It did mine." "It takes his half-century of experience and condenses it into 52 rules (actually, 53 if you include the PS) that can be used by anybody to improve his or her sales techniques. And if you don't think any of these apply to you, think again. Murray reminds us that 'everyone sells,' regardless of profession." "Simply follow one rule a week and you'll have your most successful year ever."